How do you prevent the car from hyper flashing? Every vehicle is different so the easiest way to find out if yours has a replaceable electronic flasher is to do a Google search first. If you can't find information online then you have to test the vehicle. To test, turn on the hazard switch. You will now hear a clicking sound from under the dashboard. If you don’t hear a clicking but more of an fake blinker sound then your car most likely does not have replaceable flasher unit. The sound will be coming from a small speaker located in the instrument cluster that is controlled by a computer. 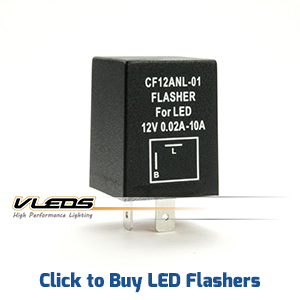 In some cars the flasher unit is built into the HAZARD switch itself, feel the switch. Do you feel it clicking? If your car does NOT have the sound coming from a speaker or does NOT have the flasher built into the hazard switch, reach up under the dash and start feeling around. The clicking will be accompanied by a tapping that can be felt in the frame of the dash. It will be noticeable but may be hard to locate. If this is the case you may need to remove the lower dash covering to access the flasher unit. The flasher will usually look like the picture on the right but there are quite a few variations. Once you locate the flasher unplug it. The hazard lights should stop working. If they continue you have the wrong part. Re-install it and continue the search. After you find the flasher unit you need to note how many contacts it has. Some have 2, or 3. Others have 5, or 8. You need to know this so you can compare them to the parts we have listed on our website. Like I mentioned before we really don't know what part will work in every car, only the cars that we have worked on. So compare yours to what we have available and see if we have a match. Once you have found a match, order from our website with your LED order and install when you install your LED bulbs. This process should take a novice about 30-40 minutes to get done. It is fairly easy to do on most cars and is plug-n-play with no wire tapping or splicing required.